Along with many lovely things, fall marks the beginning of flu season. Last year’s statistics are concerning. 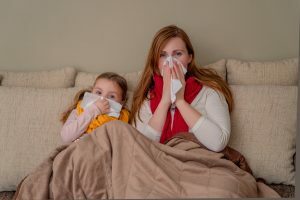 In a recent report from the Centers for Disease Control and Prevention it is estimated that flu killed about 80,000 Americans in the 2017-2018 season, the most in decades. To put this in perspective, this is about twice the number of Americans killed in car accidents annually. And while 9 in 10 people in the US use seat belts, fewer than half get the flu vaccine each year. It is tempting to feel the flu vaccine isn’t necessary – to many, the risk seems low. However, 600,000 people were hospitalized due to the flu last year, 50,000 of whom were adults under 50. Half of the children who die of the flu each year have no underlying medical conditions. Many of our patients ask about the low efficacy rates in preventing flu each year with the flu vaccine. We recommend thinking of the flu vaccine as decreasing both the potency and spread of the flu, rather than simply the number of cases prevented. While rates of prevention may be low (this varies year-to-year between 20% to 60% – the CDC estimates last year’s flu vaccine was 36% effective at preventing the flu), rates of prevention of severe cases are much higher – vaccinated people who end up getting sick have less severe illnesses. And flu virus spread is greatly impacted by small decreases in flu rates.